SgII is an acidic secretory which belongs to the family of chromogranins. It is present in the large-dense cored vesicles of the regulated secretory pathway of many neurons and endocrine cells and it is well conserved during evolution. 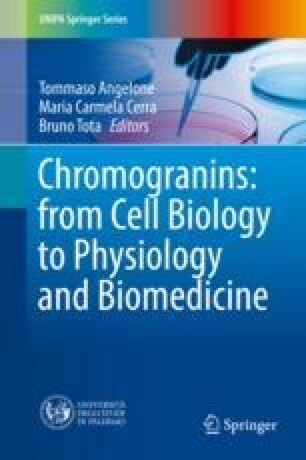 Like chromogranin A, SgII can induce granulogenesis in endocrine cells but also in cells typically lacking secretory vesicles like fibroblasts. In the secretory vesicles SgII is processed to smaller peptides, e.g. secretoeneurin, EM66 and manserin. For secretoneurin several biological effects like induction of neurotransmitter release, chemotactic activity towards immune-, endothelial- and muscle cells, and potent angiogenic and vasculogenic properties have been established. Thus, SN displays potent hormonal and paracrine effects, which help to orchestrate development, maintenance, physiologic activity and repair of the surrounding tissue. In addition, SgII has been established as valuable biomarker for endocrine tumours and cardiovascular diseases.